Mud is an adventure about two boys, Ellis and his friend Neckbone, who find a man named Mud hiding out on an island in the Mississippi. Mud describes fantastic scenarios - he killed a man in Texas and vengeful bounty hunters are coming to get him. He says he is planning to meet and escape with the love of his life, Juniper, who is waiting for him in town. Skeptical but intrigued, Ellis and Neckbone agree to help him. It isn't long until Mud's visions come true and their small town is besieged by a beautiful girl with a line of bounty hunters in tow. The most immediately involving film that I've seen in a good long while. Confidently expanding his inquiry into the essence of American masculinity, Nichols' latest pressure-cooker pastoral conjures a wily figure of endangered Southern chivalry. It's a sweet tale that displays plenty of faith in humanity without ever veering into sappiness and always keeping you on the edge of your seat. [Feels] like an adaptation of a classic novel that doesn't actually exist. A brilliant metaphor for how a child deals with divorce. Confirms Nichols' status as a rising talent in the world of independent film who's yet to make a truly major work. Though it is unlikely that Mud will live up to the expectations of those who were floored by Jeff Nichols' last film Take Shelter, it is still a powerful film in it's own right. Another winner from Jeff Nichols. Has everything- drama, romance, a little action, and at the same time is as powerful an elegy to a disappearing way of life as BEASTS OF THE SOUTHERN WILD. There's an argument to be made that there's a calculated degree of cliché to this sweet, Southern-fried fairytale, that Nichols is paying tribute here to his more mainstream inspirations. What sounds like Huckleberry Finn on the page, however, ends up like a stock melodrama onscreen. A confident, nuanced, richly satisfying coming-of-age story which is part Huckleberry Finn, part Badlands, the film is another illustration that Nichols is becoming one of the most assured US auteurs at work today. 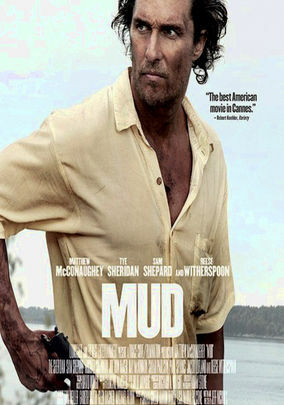 An atmospheric thriller and coming-of-age tale set on a slow bend in the Mississippi river, Mud has the look and feel of an American indie classic. A rich, sweet slice of Americana - although a little more contrived and sentimental than it promises to be at first. Nichols' Take Shelter, won the Grand Prix at Critics' Week at Cannes last year, but this is a broader, more familiar slice of Americana than either that picture or his debut feature Shotgun Stories. For the most part Nichols' follow-up to Take Shelter feels pleasingly fresh and for-real.